Add an eye-catching, high end look to your home with the Vanier Engineered Hardwood Birch Cosmopolitan Trendy Collection. This gorgeous birch wood flooring is designed with an antique distressed surface texture that provides a contemporary country look. Along with stunning style, this collection offers the enhanced durability of engineered hardwood flooring, making it an innovative and convenient choice. If you’re looking for premium quality engineered hardwood at manufacturer-direct prices, BuildDirect has you covered. Learn more about this flooring below. Real birch wood: this wood offers typically straight and even grain patterns that run throughout most of the board, with some slight waves that add visual interest. The warm brown stain further enhances the birch wood’s natural beauty. Added comfort underfoot: this engineered hardwood flooring can be installed over radiant heating systems, helping you create a warm and inviting space. 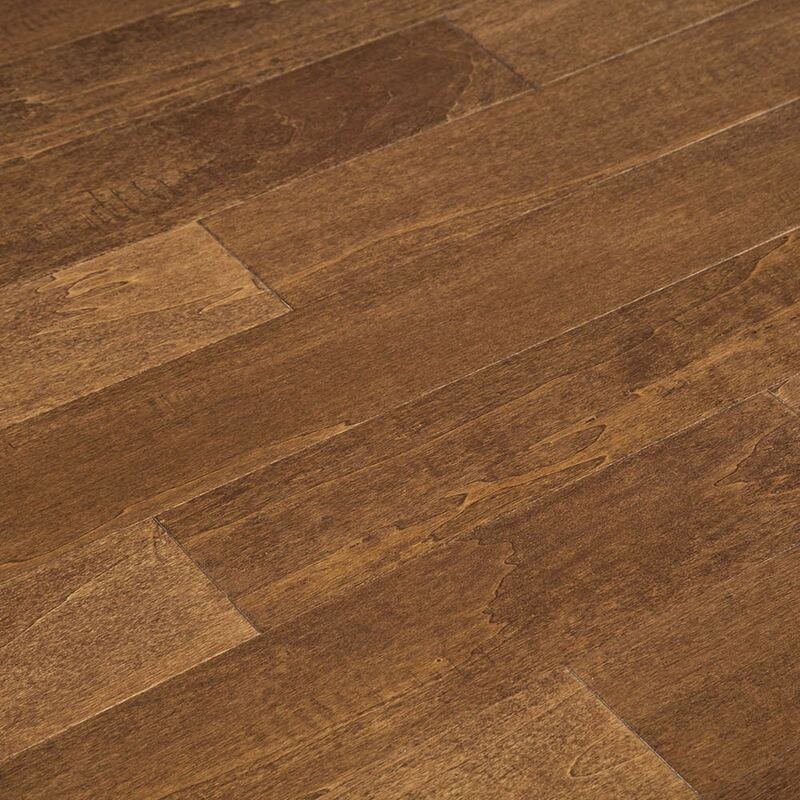 Convenient low-gloss finish: offering a more matte appearance, this engineered hardwood’s low luster finish highlights the birch’s natural grain patterns. This finish also shows fewer scratches and less dirt, making these boards easier to maintain. Core strength: for lasting stability and durability, these engineered planks are constructed with a sturdy 5 ply core. Installation choice: suitable for on, above, or below-grade installations, you can put this flooring throughout your home. Achieve the look of real hardwood in spaces where solid hardwood is not recommended. Buy with confidence: Vanier backs this flooring with a 25-year finish warranty and a 25-year structural warranty. Plank dimensions: these boards offer a 2mm wear layer and measure 3/8” Thick x 4 7/8” Width x Random Lengths (maximum length 48”). Engineered Hardwood - HDF Birch Series - HDF Natural / Birch / 5"
Engineered Hardwood - HDF Birch Series - HDF Gray / Birch / 5"
When we received our boxes of flooring, we were absolutely certain that we got sent the wrong product. It didn’t seem to match the sample at ALL. We even went back and forth with customer service, and they insisted it was the right one. The grain and warmth of the stain seemed too different. But, we decided that we liked it enough to stick with it, and once we installed it we LOVED it. I have no idea if it matches the sample or not, but it is absolutely gorgeous and I’m so glad we didn’t try to exchange it. Really outstanding customer service. They adjusted the quantity of my order and then when I had to change my order they happily did so. The two different people I worked with on this were friendly, helpful, and very willing to help me out. The product has a nice color, however it is very cheap material. The edges are cracking and breaking off as we walk on the floor. It is extremely easy to scratch and dent. I am very sorry I installed this in my whole house. It was not represented as being so soft and fragile on the website. I would never purchase from here again. Looks great and is pretty easy to install. One bad thing is I've had a bunch of defective planks.